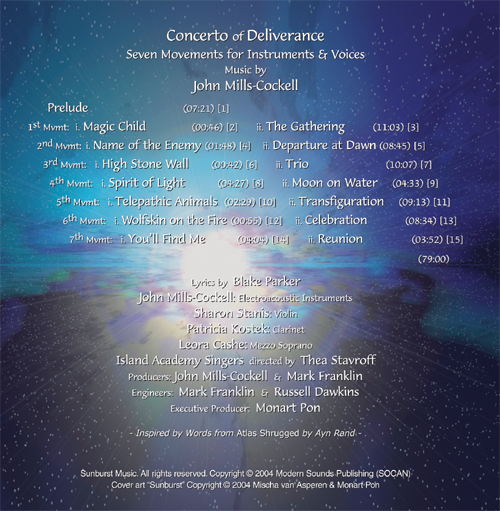 Here you will find information about the album: Brief Overview, excerpts, reviews, production notes, and other articles, such as an interview with John Mills-Cockell, the composer commissioned for the work. Here is an opportunity to discover new possibilities, remember past experiences, and arrive at life's purpose. If you like modern music, try Sample 2 & 4. If you like classical, try Sample 1, 3 & 5. If you like vocals, try Sample 6 & 7. If you like all kinds, try them all. you'll like the album as a whole. These are but 8.5 out of 79 minutes of rich, moving, and memorable music. From "Wolfskin on the Fire"
"She sat listening to the music. It was a symphony of triumph. embody every human act and thought that had ascent as its motive. It was a sunburst of sound, breaking out of hiding and spreading open. It had the freedom of release and the tension of purpose. It swept space clean, and left nothing but the joy of an unobstructed effort. there was no ugliness or pain, and there never had had to be. It was the song of an immense deliverance." A full-length CD, 79 minutes - 15 tracks, of original music. To be listened to and enjoyed, like a book is read, or a movie watched. Your CD will be shipped to you within 24 hours of receipt of payment. *If ordering 1-3 copies, add this amount for each CD ordered. Ask for a discount if ordering 4+ copies. 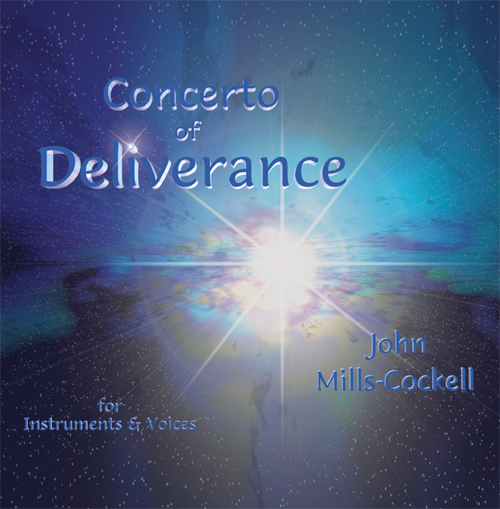 Why you would want a Concerto of Deliverance? to someone who e-mails us their answer. Send us your reasons, whether or not you've heard the music yet. Check back for new features! *Sunburst Music. All Rights Reserved.